I patronize many bars in the Manhattan are for cocktails but there is one bar that owns the largest single malt selection in NYC, Keens Steakhouse. This is just one of the quirks that make this venerable Manhattan meat-eater’s sanctuary on West 36th Street so endearing. 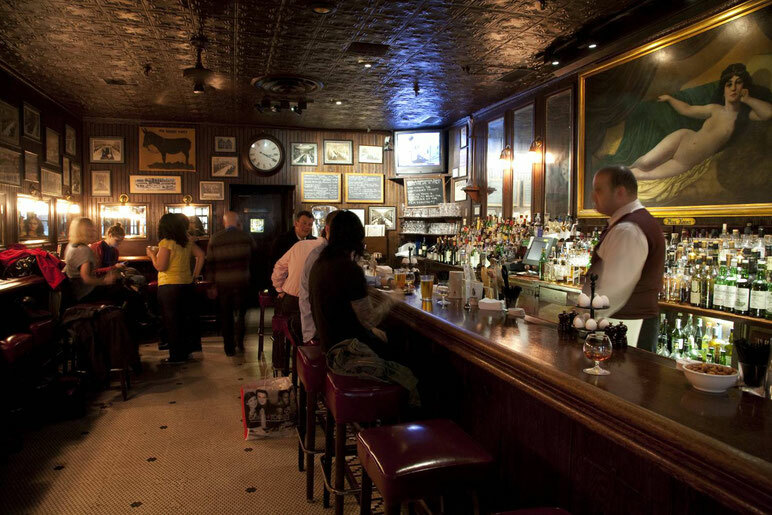 It was opened independently in 1885, when the area was part of the theatre district, but before that it was part of The Lamb’s Club, an actor hangout. Open the heavy wooden door and you’re entering the palpable past–dining rooms of wood-panelled, perpetual dusk courtesy of the frosted glass windows, and of ceilings decorated wall-to-wall with the largest collection of churchwarden pipes in the world. These hard-clay, thin-stemmed, small-bowled implements–you’ve seen them in Dutch paintings–were allegedly the remedy for driving away “evil homourse of the brain.” They’re a remnant of the days when men would leave their favorite warden pipe at their favorite inn. Keens once had a Pipe Club of more than 90,000 members, among them Teddy Roosevelt, Babe Ruth, Will Rogers, Billy Rose, Grace Moore, Albert Einstein, George M. Cohan, J.P. Morgan, Stanford White, John Barrymore, David Belasco, Adlai Stevenson, General Douglas MacArthur and “Buffalo Bill” Cody. But today we’re not here to speak of smoke, but of smoky. Meaning the Keens single-malt scotch list, which at 308 different labels, “plus 10 downstairs that we’re holding back,” says the suave Brandon Falzone, one of the list’s two keepers, is the largest at any restaurant in Manhattan. The list requires a triptych menu, and is divided into the traditional single-malt genres (Highland, Highland-Speyside, Lowland, Islay, Island, and Campbeltown, plus “Single Malts From Unexpected Places” such as Texas, India, Japan, and Virginia.) The bottles themselves form a grandstand behind the tin-ceilinged bar, with more decks below the sightline. The collection was started in the 1980s by owner George Schwarz as a way of making Keens stand out at a time when the neighborhood was going south. (It’s now going north.) What you get at Keens is access to a single-malt museum, with some bottles that are endangered species. “The industry is changing,” says James Conley, a 17-year-veteran and the list’s senior curator as it were, referring to the fact that distilleries are now increasingly making scotch ready to drink now–”non-aged and less use of sherry barrels, all geared toward Millenials,” he says. He offers the heavily peated Octomoor as an example of a single-malt that lives up to novice preconceptions. What you want to go for at Keens are the single-malts from distilleries deceased, signified by an asterisk that means “going, going”, but that live on here for now (Brora 35 Years, for example). The fun part of the menu is to pin the tail on the donkey–point to something and ask Brandon or James to explain your shot in the dark. I went for the Ledaig 10-Year-Old from the Isle of Mull, and it lived up to Brandon’s precis (“lightly smoked, fleet on the palate”). As for this duo’s personal favorites, Conley characterizes the MacAllan 25-Year-Old ($174) as “a little piece of Nirvana”, but also cites the Highland Park 18 ($22, from the Orkneys) and the Caol Ila 15 ($22, from Islay) as value stand-outs. As for Brandon, he’s a Springbank man, and suggests the Cask Strength 16-Year Local Barley ($30), an example of the new single-malt locavore trend, making the scotch from barley locally grown.